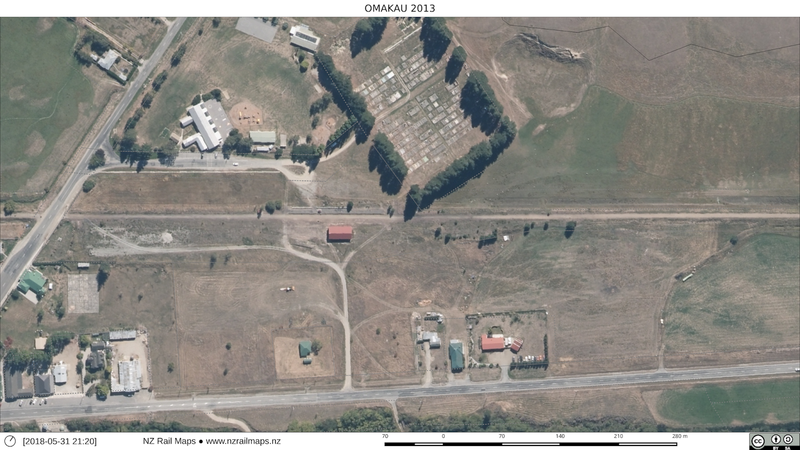 I am revising the maps of Omakau at present. 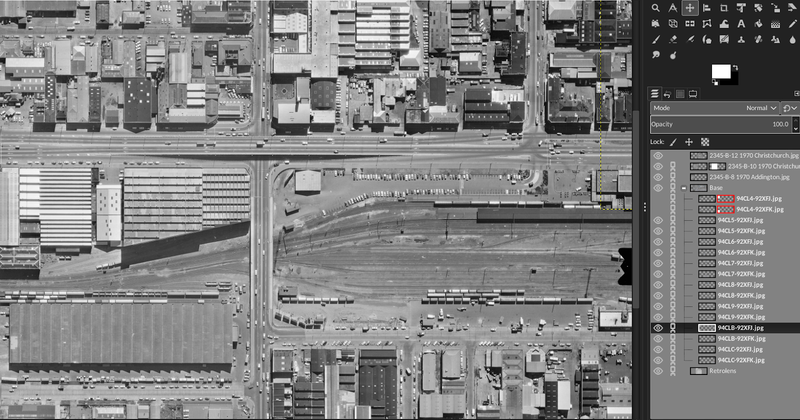 This has allowed much sharper historical imagery due to lessons learned in how to get the best result out of Gimp. 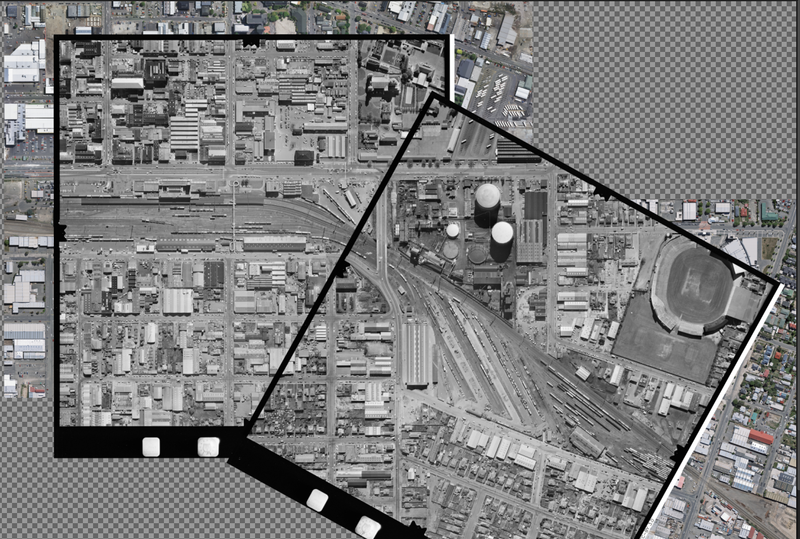 At the same time I have added a 1938 aerial photo and the masking has been extended to cover more of the station precinct including all of the triangle and housing sites. Here are some samples, the full maps will be completed in a day or two. 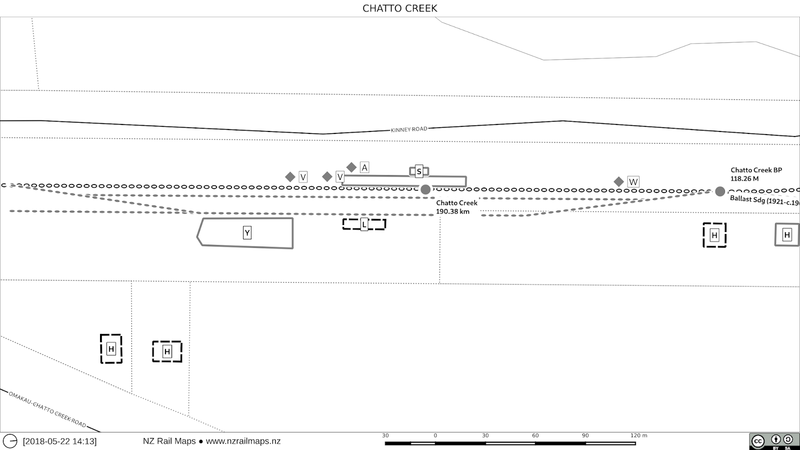 Here are the completed maps and diagrams for Chatto Creek. A point of interest is near the 119 milepeg where the chainage chart shows a siding for a "Rails and Sleepers Depot". 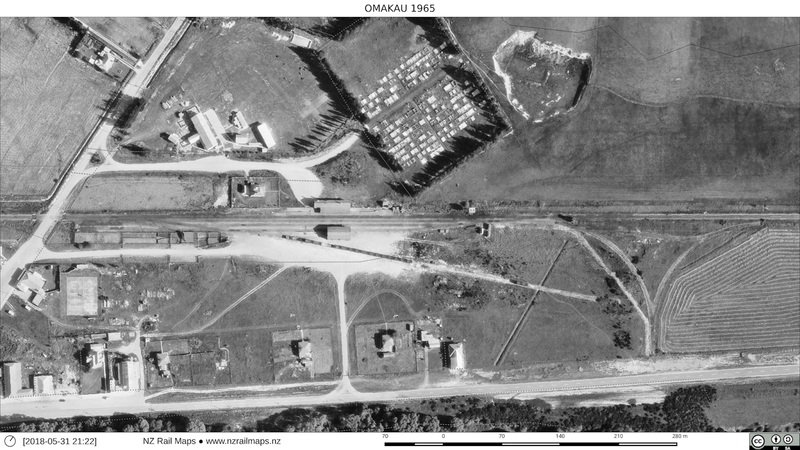 This is not particularly obvious on aerial photos so it may have just been a construction facility when the line was being built. Here is a link to a post on Facebook about a map of the Moutohora Branch drawn by Graeme Jupp who is a retired professional cartographer. If you are not a member of the group the post appeared in you will have to join, if they won't let you in too bad, I can't do anything about it. The map resembles the style of the old NZ Topo 260 maps which Graeme created in his professional work. It is quite different looking from the maps I produce. This post is not in any way denigrating the differences. It is largely of interest to me to see a similar type of map created and published even if it looks quite different. Whereas Graeme has focused on producing a bespoke map of an individual line I have focused on using the GIS software to "mass produce" maps of the whole country and that approach is what I believe is the right one for me to create the maps that cover every square centimetre of New Zealand. 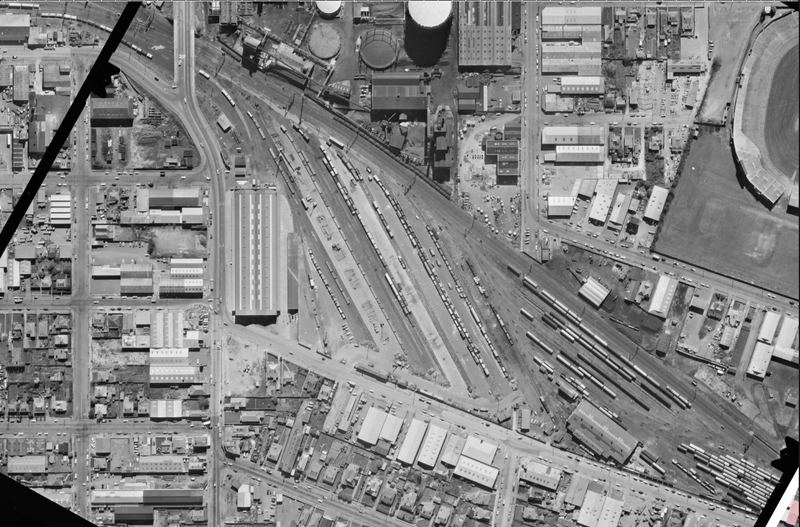 Most of the effort I am doing is going into working with aerial photography whether current or historical to show the layouts of particular stations on each line and that is the particular level of customisation I feel I want to focus on for each map. Graeme's map has a lot more research in various archives involved from producing it, from various sources that I don't feel I have the time to spend looking up. 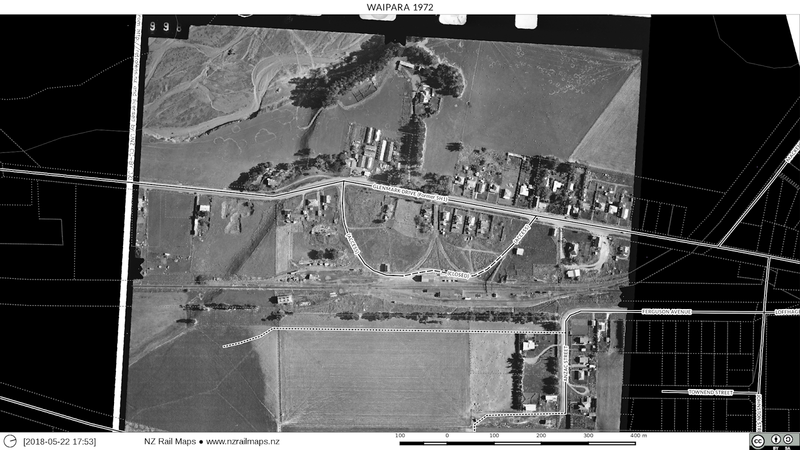 Apart from one visit to Dunedin Archives last year the majority of research I have done is online, which means from aerial photographs rather than railways records. Volume 5 of the maps for the PNGL will be updated as I have referenced it many times, it will be concurrent with some other areas but won't get a lot of attention until the Central Otago stuff is completed. In the past I have talked about online platforms for maps. There simply isn't a suitable platform for NZ Rail Maps to go online in a virtual globe format in the foreseeable future. Open Street Maps is not a platform where anyone can create historical data. 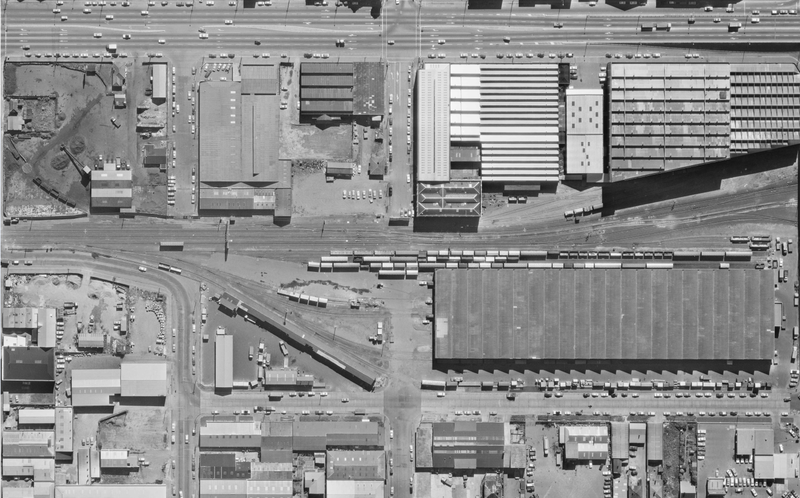 It looked like they would be a promising option in the early days of the platform but they have refocused and it would not be possible to add the wealth of historical data that is in NZ Rail Maps into the OSM platform. Google Maps is too limiting so that only leaves the present platform which of course is going to continue for a long time. It'll be a few days until I have some more stuff to publish so this is just a quick interim update. 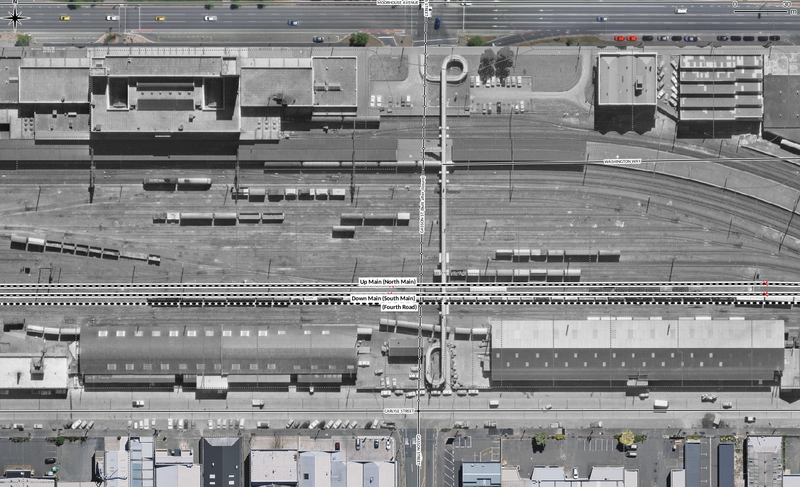 Main South Line (Christchurch): the 1940, 1950, 1961, 1984 and 1994 tiles are now added to the original 1970 tiles for the station yard ready for documenting a few changes over those generations. I have spent the past few days also putting in all the yard tracks for 1970 and naming them from the yard plan. I expect the yard track will only be documented for 1970 except for big changes, I am not intending to check every single track, it will mostly be around the sheds and passenger station that changes will be documented as these were the major ones. Napier-Gisborne Line: This was not actually planned to be worked on at this time but because a professional cartologist has released a map he drew of the Moutohora Branch, this is of considerable interest to just give my maps a quick tidy up and in order to have the best result I am downloading at present all of the Retrolens coverage of the route and it looks like there is a lot of 1940s era coverage which while not of the highest quality will still fill in a lot of details. 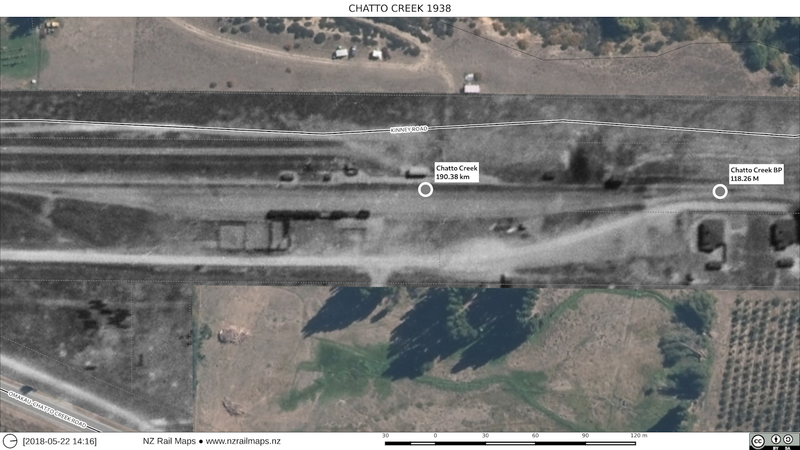 I also expect to download all the most recent Linz aerial photos of the route (I already have all the stuff for the NGL itself) and get the map project ready to be updated, but this means the MSL stuff will have to slow down as I still feel the Otago Central content needs to remain a high priority. So there is the update. 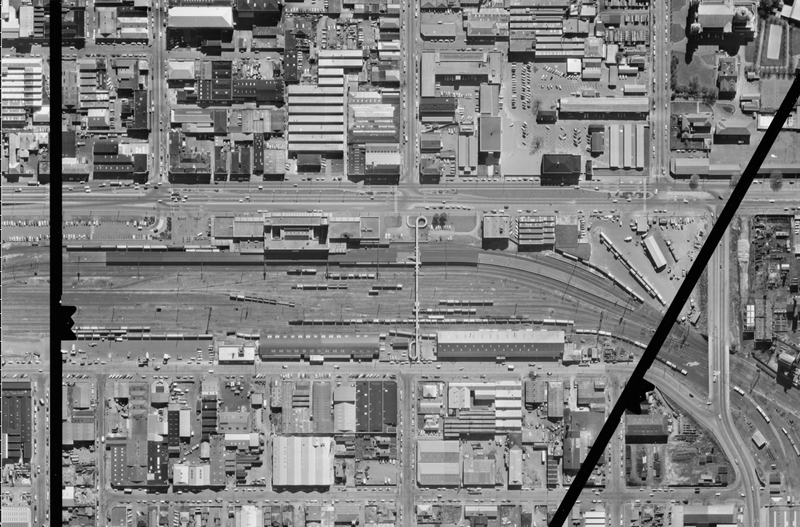 In the meantime I have begun drawing the track at the station and other details and here are a couple of comparison shots from 1970 and 2015. 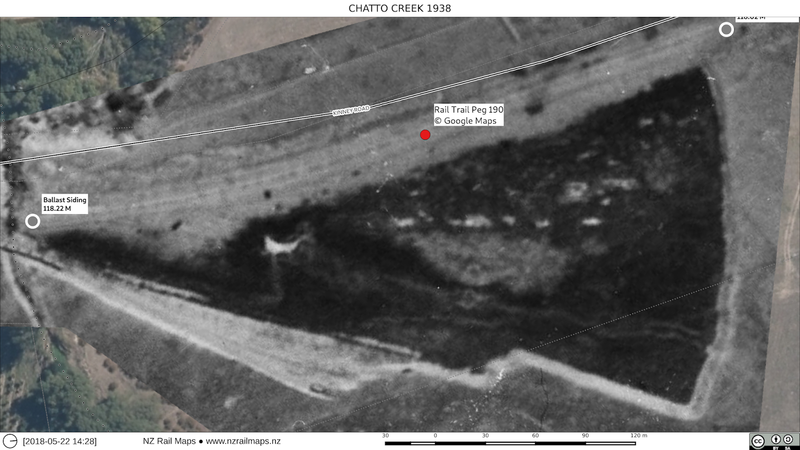 This an interim post as the maps for Chatto Creek station are currently being updated to include 1938 and 1956 aerial imagery as well as 1965. 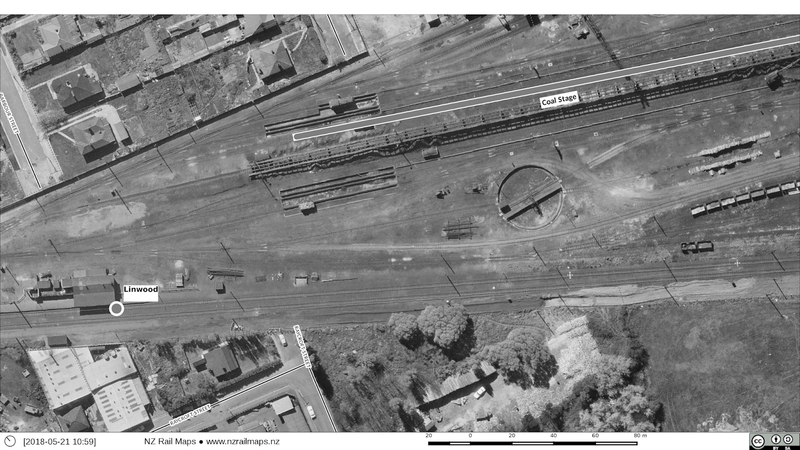 The earlier aerial imagery shows details of the ballast pit being open for example as the masking has also been expanded to include the ballast pit area in the mosaic maps. 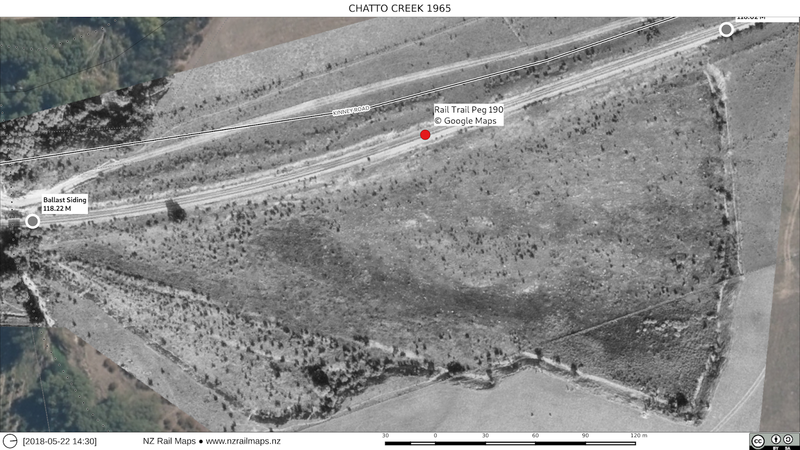 These two pictures show the 1965 and current aerial imagery for Chatto Creek. The maps for this station will be finalised as soon as the additional historical imagery has been incorporated into the mosaics which should be completed by the weekend, enabling another stage of the finalisation of the maps. One of the changes I am now doing with all the aerial mosaics is to render tiles that contain the full aerial photography for an area so that these full images can be used as part of the maps produced. 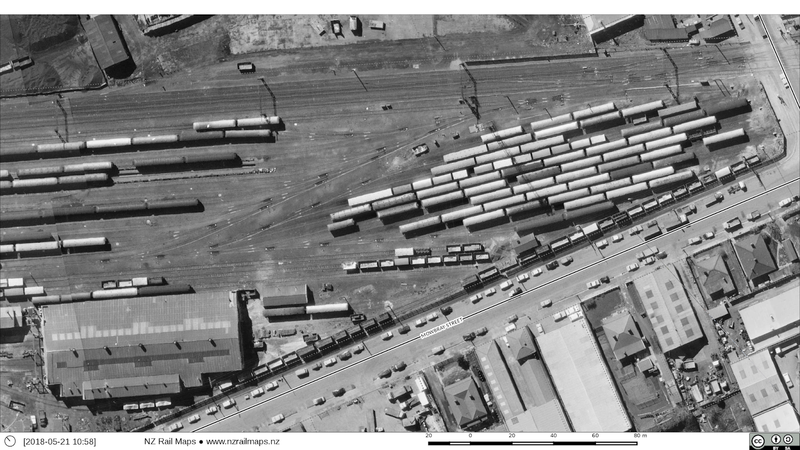 The full aerial images are mainly of benefit for seeing how a greater area around a rail site has changed. I have just been back to the Waipara mosaics project in Gimp and generated the full image tiles for all four of the map eras represented. It's fascinating how much the township itself has changed. 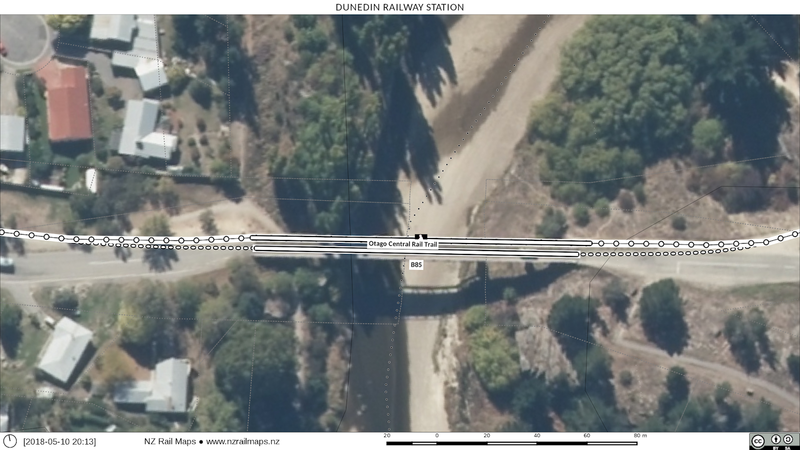 At the moment creating a map series for the rest of the Waiau Branch is not a priority but it could well be one of the first things done after completing the Otago Central Railway series. Other possibilities would also include the Napier to Gisborne Line and the rest of Volume 12, so I will have to see how the priorities go at that time. For now it is Christchurch alongside the Otago Central with each of these getting about equal time alternately and sometimes simultaneously as I have four computers at my desk and all of them can be used at the same time to work on different map tasks. For example tracing out the sections of the OC Rail Trail in Google Streetview can be done on win10pc, Gimp tasks on serverpc, the OC map project on mediapc at the same time as it is playing music videos and the CWNM map project on mainpc. 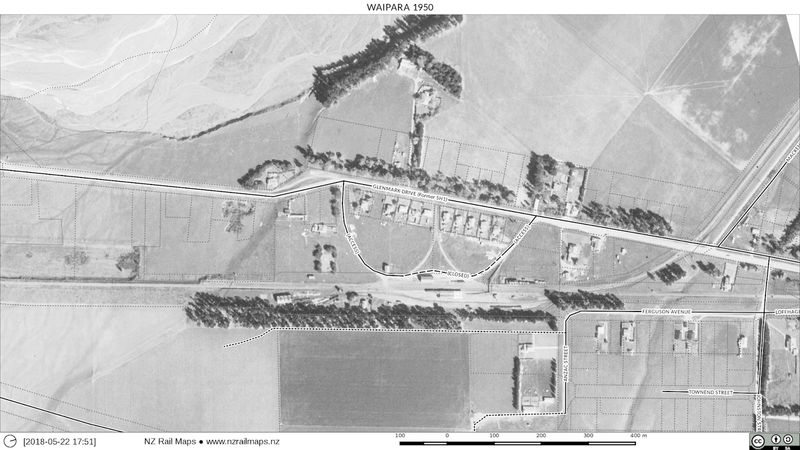 So here are the full images of Waipara township through four eras. I have chosen to hide the rail features as it takes a lot of work to display them in each era, it is just easier to display the aerial images by themselves. 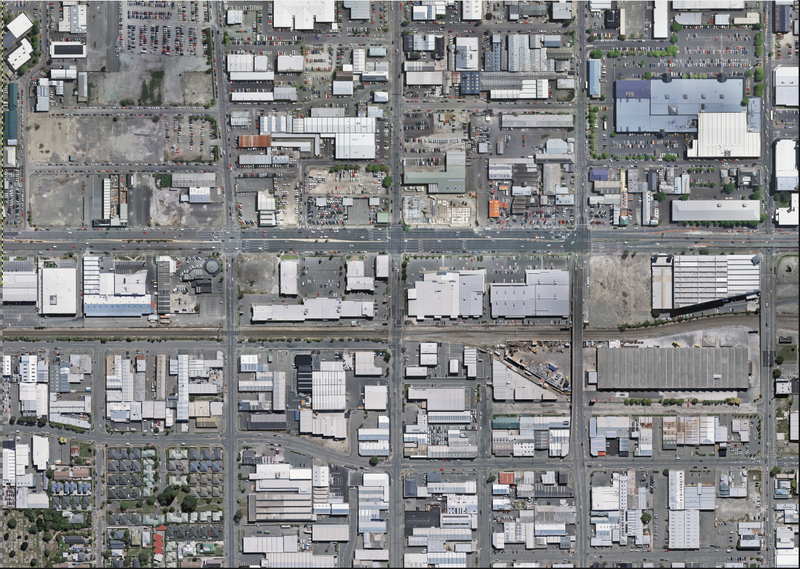 So this has been a lot of work but I now have usable aerial photos of Christchurch, Linwood and Opawa. 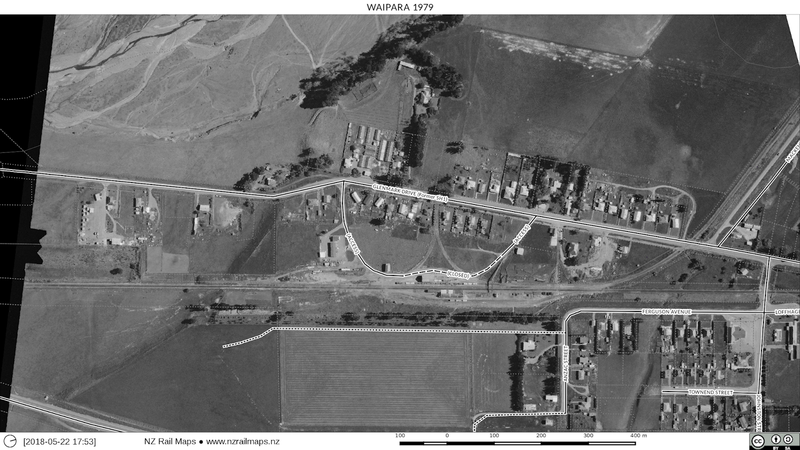 As I noted previously I chose to extend the limit of the previously drawn maps from Wilsons Road out to the Opawa bridge. This means the total length covered is from just under 9 km, to 11.75 km - a total of nearly 4 km. All the tiles have been rendered (a total of 29, which is a lot considering how long it takes the computer to generate each one), but one needs the mask to be altered and then re-rendered, and I'm looking to add several more around the edges. 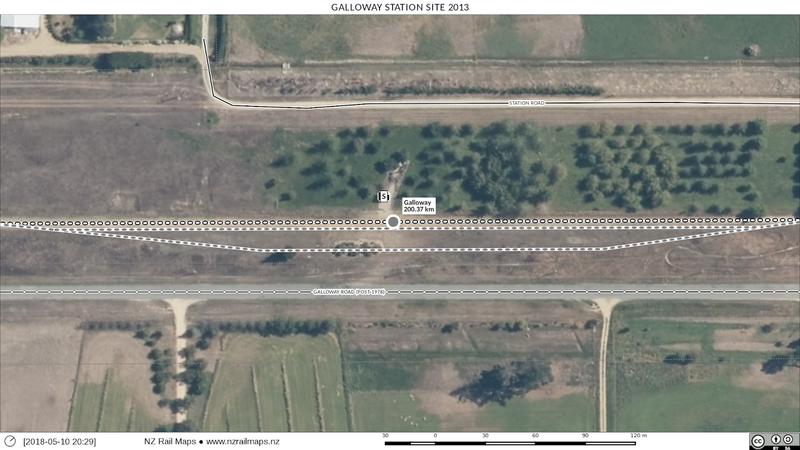 With all this work the Otago Central maps have had to wait except for one post about Galloway. 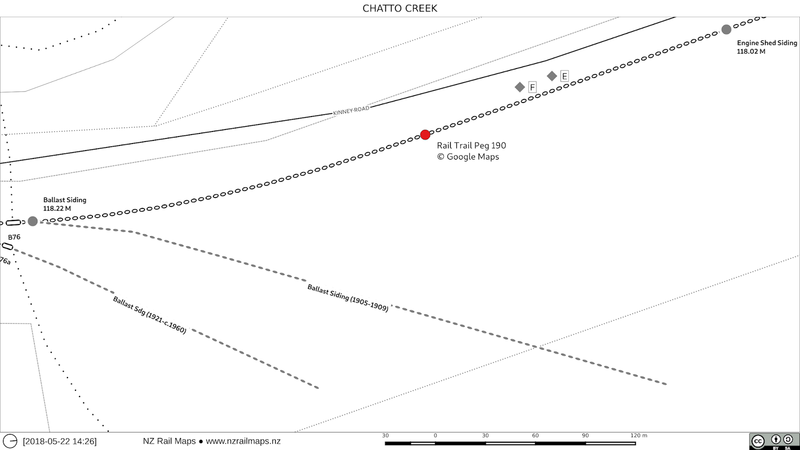 Now that I have the Christchurch maps I will be working on them at the same time as carrying on with the Central and working up to the next station at Chatto Creek which shouldn't be a lot of work, and then further onward. In fact this section of the Central maps shouldn't take long to do. Here is some of the Christchurch stuff that hasn't been published so far. Waltham Bridge (as it was in 1970), part of the gasworks, E shed and the freight sidings. 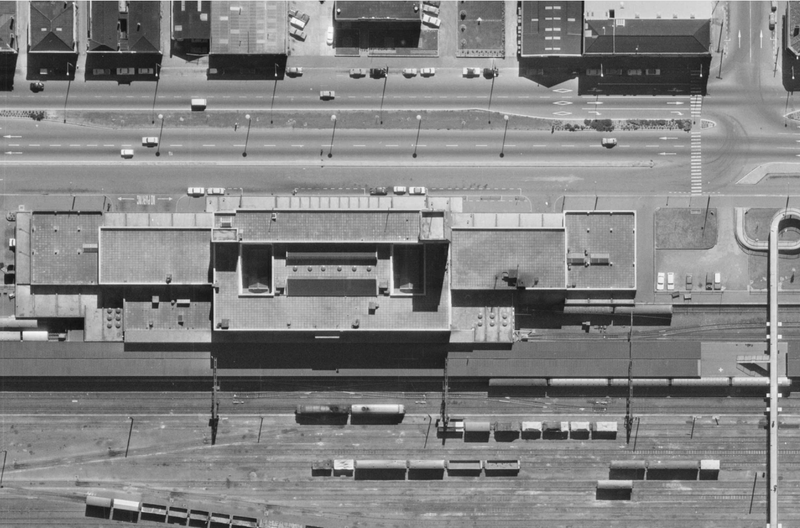 The car depot building and carriage sidings. With the demise of many passenger services the sidings to the right made way for the Daily Freightways shed, which is now occupied by Southern Demolition. Linwood station and part of Loco. 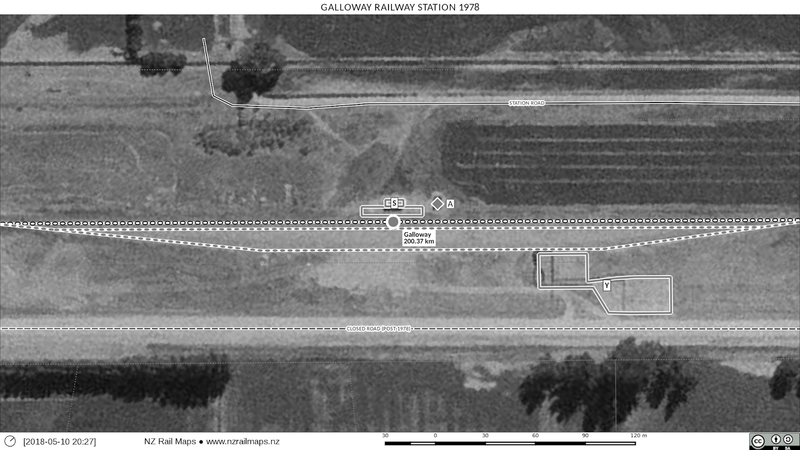 The station was removed when passenger trains to Lyttelton ceased, not too many years later. The main Loco buildings adjacent to Ensors Road crossing. Opawa station and the bridge. There was a footbridge alongside the railway structure for easy access to the station. This is another passenger-only station that is long gone, and the building through of Brougham St (1990s?) has altered the landscape significantly since then. 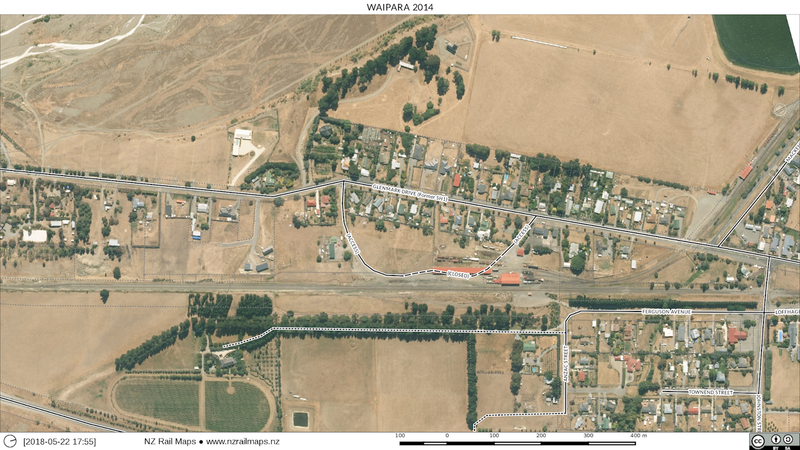 So I have finally completed the aerial mosaics that will now cover from the western station limits of Christchurch all the way to Opawa. As usual it has just proved easier to add the images for Linwood and Opawa to the Christchurch ones and so these extra steps have been completed along with Christchurch/Waltham. In along with that I installed the new version of Gimp (2.10) and one of its features is the unified transform tool which makes it possible to combine the scale and rotation steps. In short, it is much easier to use than the scale tool because you can deform the image as well, which means in effect you can pretty well drag it to the exact proportions you need. I have been using a development edition of Gimp (2.9.7) for some time and this release of 2.10 improves on some issues as it is a production version of the software. 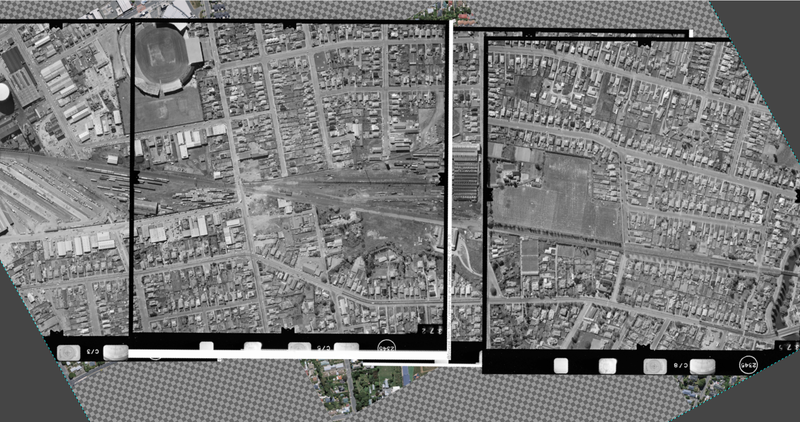 Here is the Gimp mosaic for Christchurch West-Linwood-Opawa which will now be split into several pieces to allow the production of the map tiles needed to be loaded into Qgis. Mapping will then resume. The past few days have been busy, however I have made a reasonable amount of progress and these images reflect that. I expect to have the mosaic map tiles for the entire area of Christchurch ready by the end of this week. Here are samples. 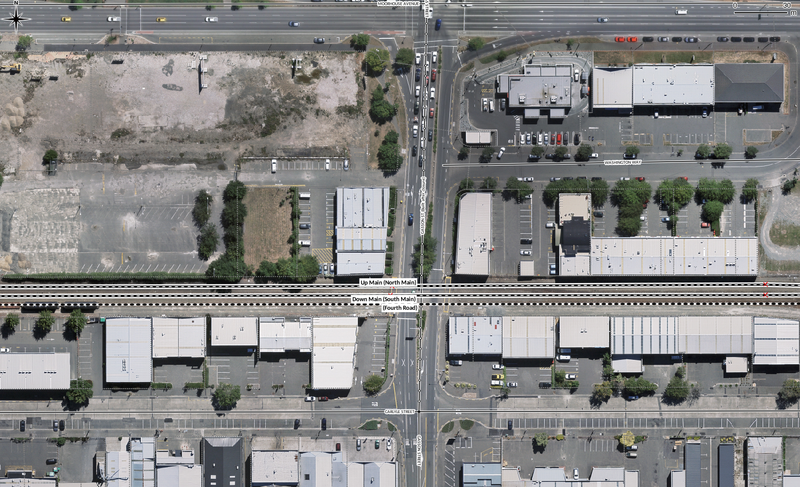 Right now I just need to add one more aerial photo to complete Christchurch Station and hopefully that one will also cover Linwood at the same time. Working with Gimp over the past couple of days has led me to knowledge that will massively speed up the creation of mosaics. Briefly that is the ability to drag-rotate an image in place with a preview of what it will look like for each rotation, and to drag-scale an image in place with a preview, likewise. You then click the appropriate button and the image is actually rotated or scaled. As up until this point especially the scaling step has been very time consuming trial and error guessing the size needed because the scaling step itself is slow, it can take 5-10 minutes to complete a scale and then if it is wrong you have to undo and try again with new numbers. So because of this I expect this phase to speed up greatly. At the moment I am just finishing the West section of the map up to and including B Shed. The Centre section will follow fairly quickly after that. Having fewer scaling and rotation steps, apart from increasing the speed of mosaic production, will also reduce the quality loss from multiple processing steps. 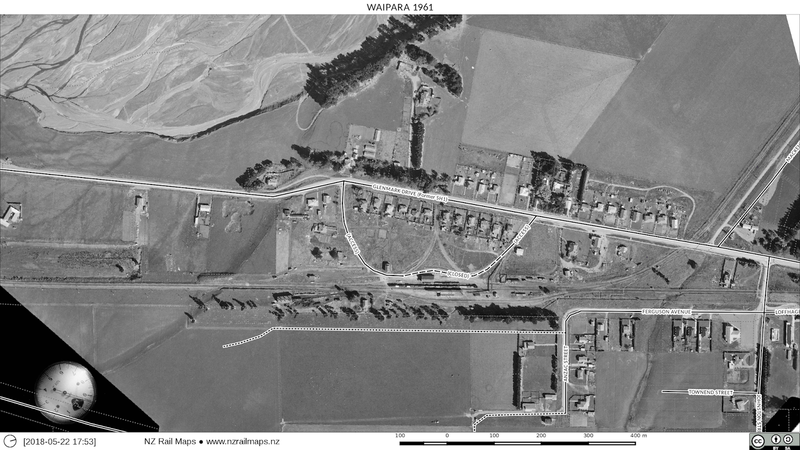 Some of the early mosaics I did of Central Otago had lost quite a lot of the archival image quality by the time they got into the maps. Some of this, however, was also down to choosing the best interpolation algorithm for processing. B Shed and part of the main station yard as seen in Gimp. The West mosaic is just about complete and part of this project will become the Central mosaic as it makes use of the same aerial image, 2345-B-12. So I am continuing drafting the maps and there will be a series of posts each taking in a major station and the track from it to the next station. This will be presented in reverse mileage order, the same as I did when I wrote the Observer articles. 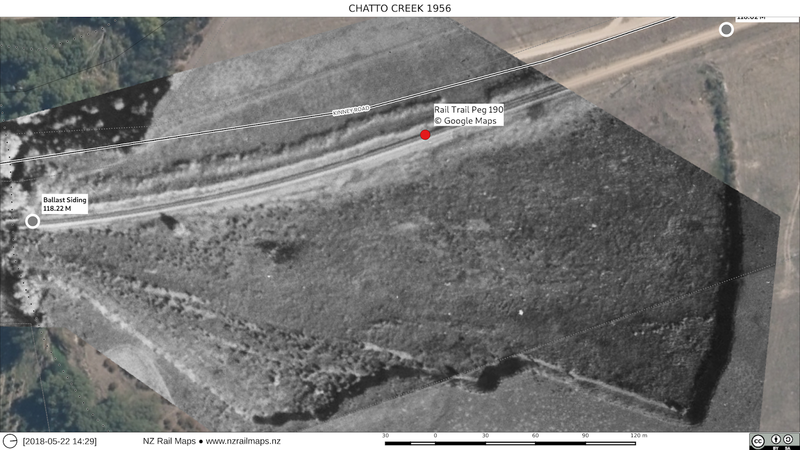 I am combining this with viewing the entire amount of Google Streetview data of the rail trail, and creating a layer of points that show where the Rail Trail Trust has placed their kilometre pegs. These pegs, assuming they don't get moved, provide further points of reference along the trail, but we cannot assume they are in the exact same places as the original pegs that were installed by NZR. Because the locations are obtained from Google Maps, these peg positions cannot be published in the maps, however a map or layer can be made available for separate download and this will be accomplished in some way when the maps are published. There are few features of interest between Alexandra and Galloway. 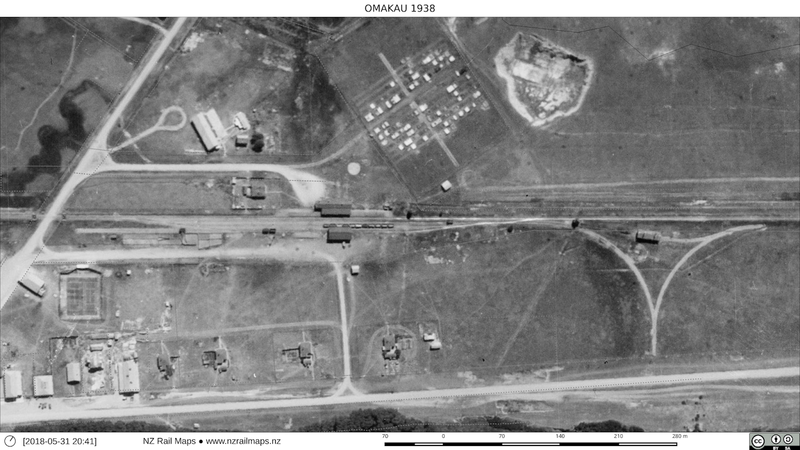 In fact the only significant one is the former combined bridge No.85 which is also known as Manuherikia No.3 Bridge because it was the third railway bridge across the Manuherikia River. 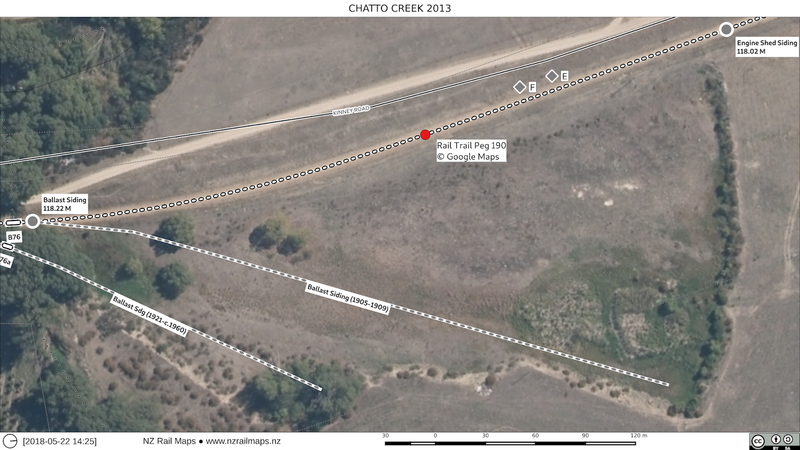 The rail trail follows a walkway clipped onto the side of the bridge, but of course the railway shared the same space as the road when the line was open; hence the way the map is drawn in the image above. So after 7 km from Alexandra we get to Galloway. This was only a small station with a platform, a shelter which doubled as a goods shed, and a stockyard. There was a men's toilet at the position indicated by the letter A. This is how Galloway looks today. The remaining part of the station building has been relocated back to nearly, but not quite exactly, its original site. None of the other facilities have any trace left of them. 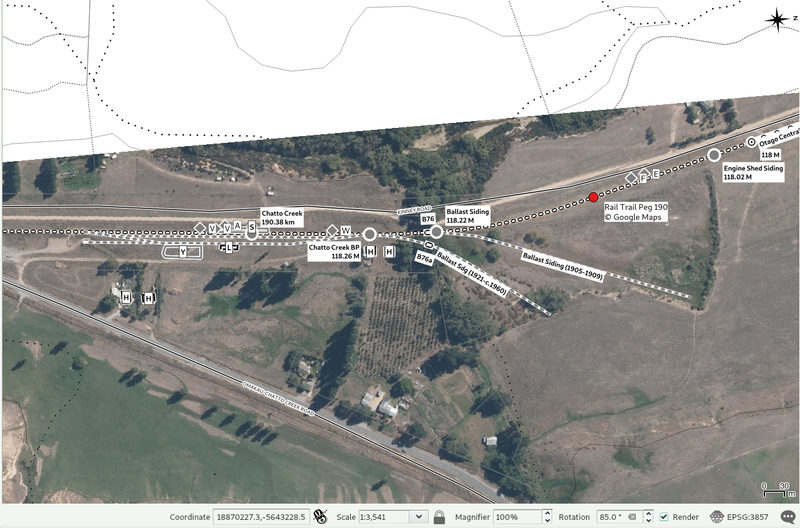 I have chosen to show the locations of the sidings on both maps even though there is no track left there today. So here is what is being mapped first of all. 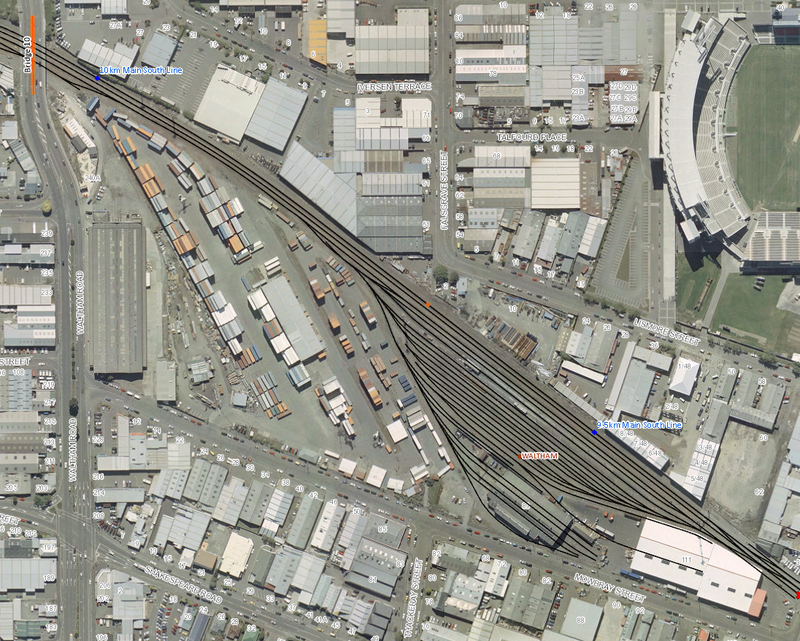 This area just had industrial sidings except for B Shed. 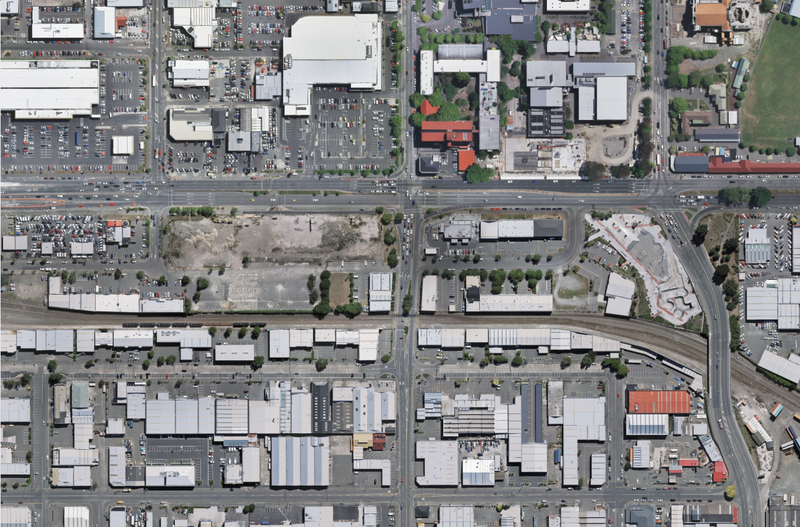 As you can see the map tile boundaries conveniently end just off the west side of the Colombo St overbridge. This map shows the B shed area itself. Opposite it are the Dalgety premises with quite a bit of track in there. This today is the site of Harvey Normans. There is a coal yard to the east. Well this is a new series that will cover the Main South Line within the Christchurch suburban limits (Christchurch-Rolleston). We have already had a detailed look at Addington, which was treated as part of the Main North Line, as it is a junction station. 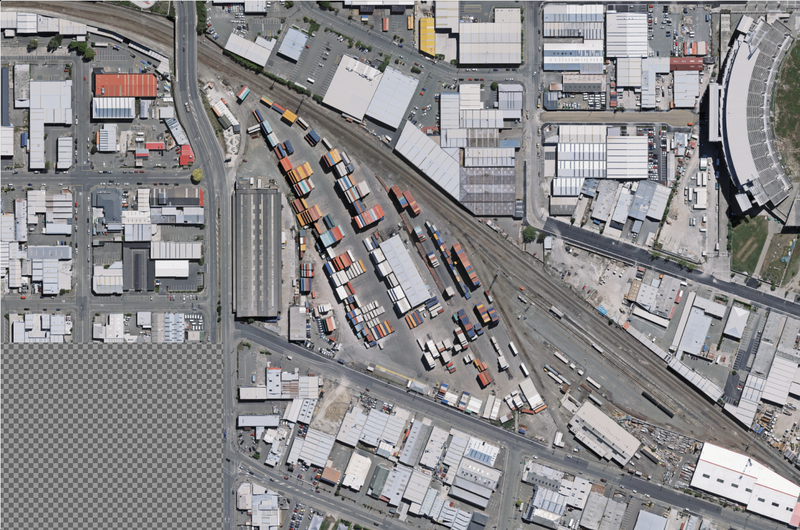 Christchurch is immediately west of Addington, and the mosaic aerial maps for Christchurch are being started from the ones that were created for Addington, which due to their size were split into three separate Gimp projects. 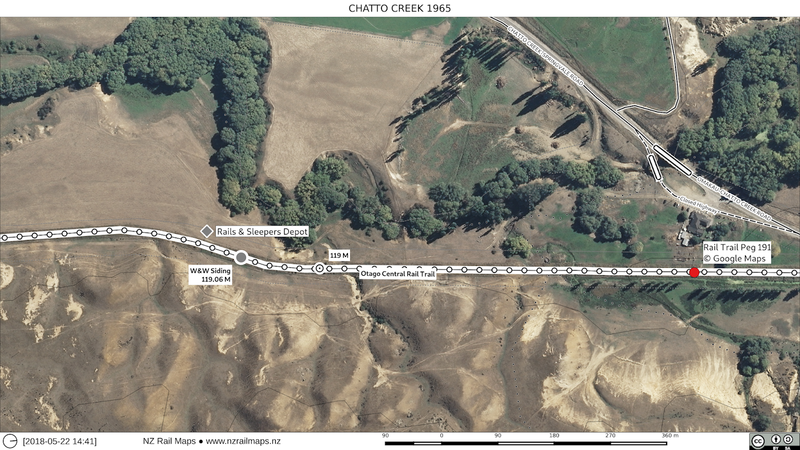 For the purposes of these maps we define Christchurch as being a length of the MSL starting from Wilsons Road crossing (9.28 km), and ending between Antigua Street and Selwyn Street crossings (about 11.75 km). In other words it is quite a long section of the MSL (total about 2.5 km) and will be split into three files for creating the aerial mosaics, but these will be seamless when the maps are printed out. The boundaries that are used to define "Christchurch" on these maps, while based on the NZR definition, are not necessarily representative of actual "station limits". 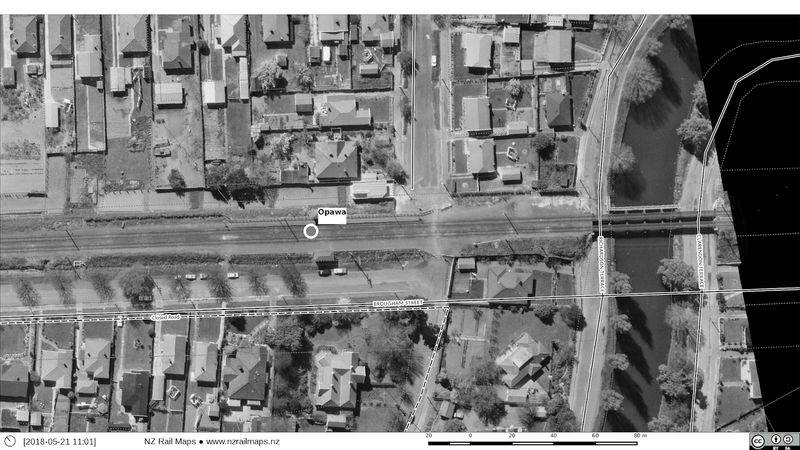 However "Christchurch" did cover a wide area as the signalling system used the signalbox at Christchurch station which controlled tracks and signals throughout that area. 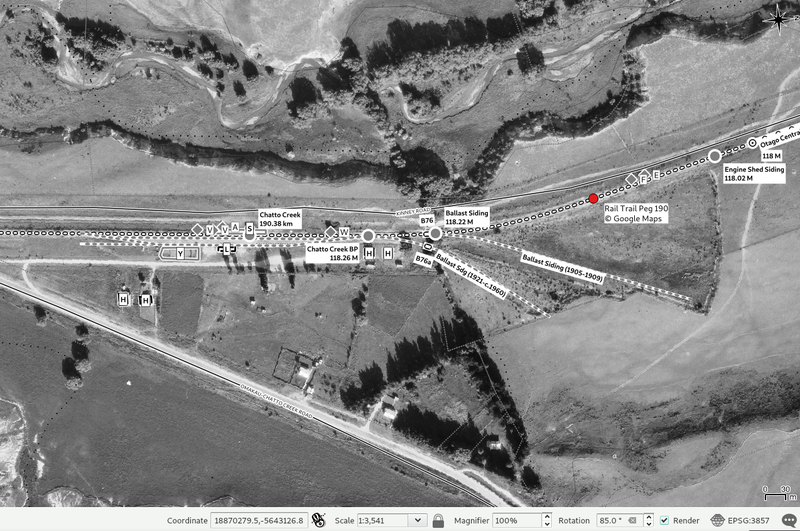 This section is shown courtesy of a screendump of the Kiwirail Alcam maps below. 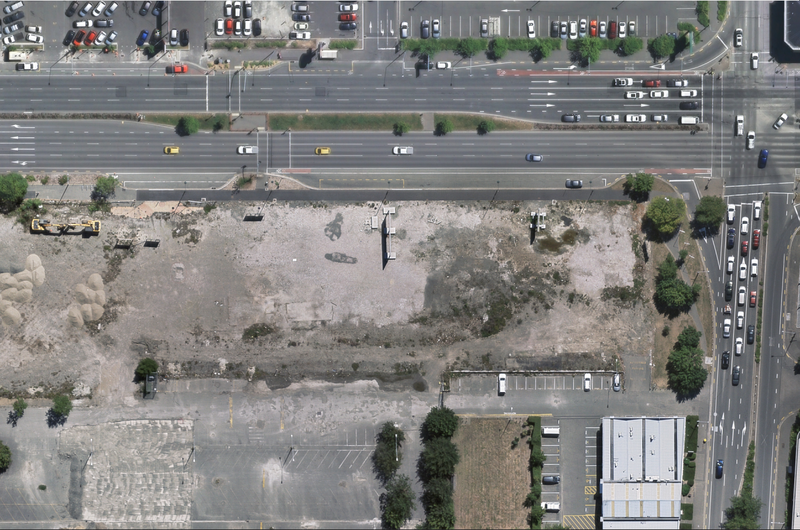 The former Christchurch B freight shed building and site. The building is still owned by NZRC, but has not been used for railway purposes since the mid-1990s. The former Christchurch railway station and shunting yard. The station building shown here was demolished several years ago but it had not been used for railway purposes since the mid-1990s. Most of the yard land has been built on since the yards shut down around 1990. 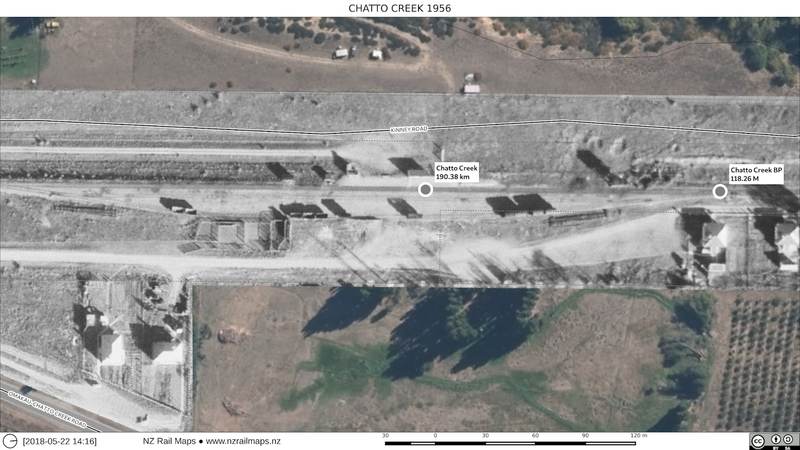 This site also included A, C and D freight sheds. The former E freight shed complex and the Waltham carriage depot. The car yard is still in use by Kiwirail Scenic Journeys. 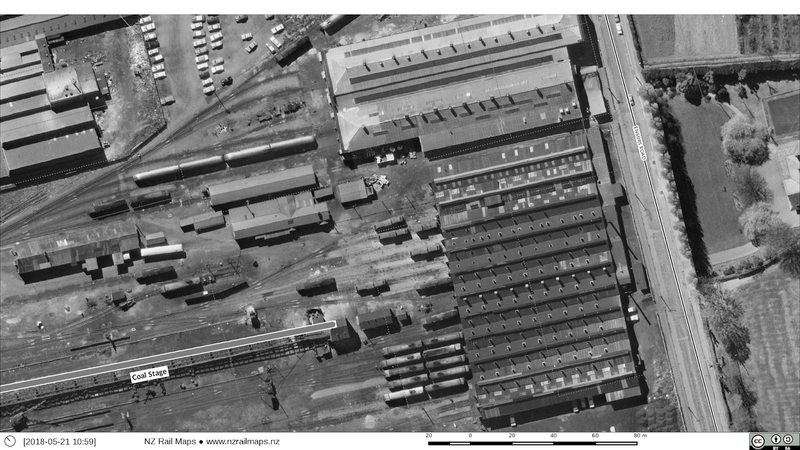 All the above sites also included industrial complexes that were served by sidings which will be detailed in the series of articles that will be produced. 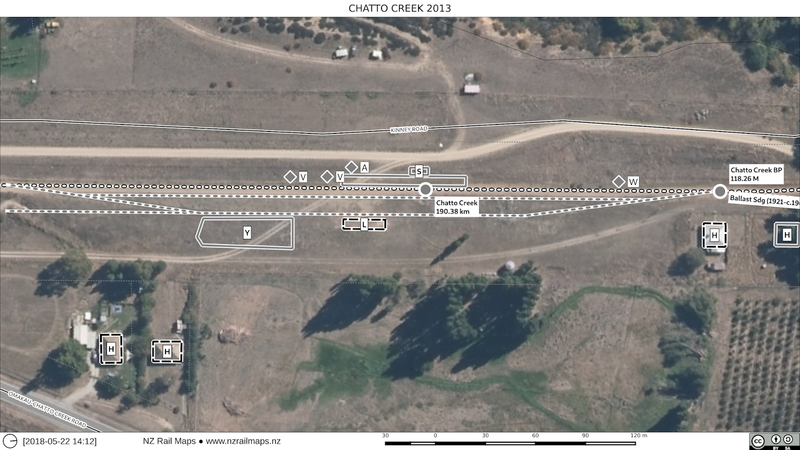 The first stage of preparation for writing the article is to create the map mosaics, a relatively slow task and one that will go on alongside other map work currently being done for the Otago Central Railway, so it will take a few days to create the first one called "Christchurch West".